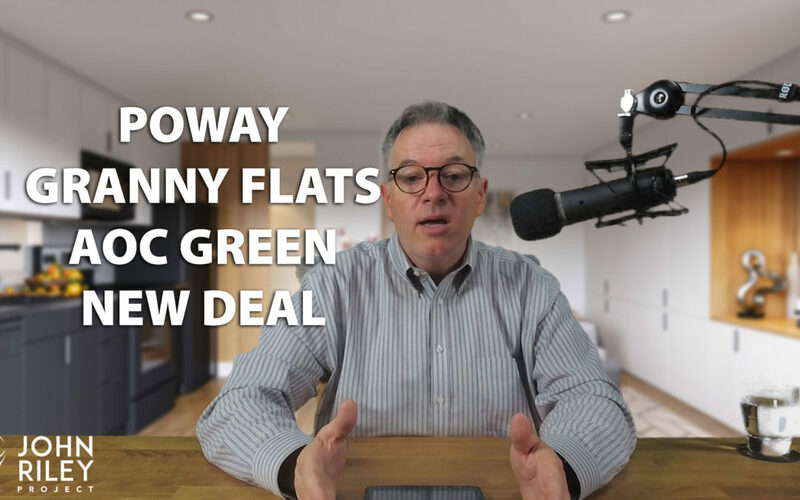 In this episode we get into two hot issues: Poway Mayor Steve Vaus’ proposal for government subsidized Poway granny flats and NYC Congressperson Alexandria Ocasio-Cortez’ proposal for the Green New Deal. At the local level, we break down Vaus’ HOMES (Homes On My Extra Space) plan in Poway. There is good buzz going on in California, in San Diego and here in Poway about addressing the housing crisis. San Diego Mayor Kevin Faulconer has proposed plans to make construction easier and to combat NIMBYism that thwarts new housing growth. Faulconer’s proposal is a good one, but Vaus wants Poway to go “One Step Further”. Vaus’ plan has the city buying the granny flat building, placing it on the land of a Poway property owner, then splitting the revenue between the city, the property owner and a property manager to manage the process. Some think it is a good plan to encourage more granny flats and provide affordable housing for low income tenants. But is it a moral plan? Other property owners, that may be denied a granny flat or simply do not have room for one, end up paying property taxes so a different property owner is rewarded. How are they rewarded? They get a revenue stream, they get an upgrade to the property that makes their home more valuable and they get the granny flat building as a gift after 10-12 years. The right answer is to remove govt control, not more central planning. I break it down in this podcast. We also get into Alexandria Ocasio-Cortez’ Green New Deal, her political strategy and the moral cause she is championing. But is there an opposition that is engaging in the battle of ideas from a moral perspective? I am not seeing it, but I try to make the case. We also discuss San Luis Obipso, my daughter Shannon, the Poway vs Rancho Bernardo basketball big game, Padre Manager Andy Green’s proposal for extra innings, San Diego State Aztec Basketball, Brady Hoke, Frank Robinson, #PadresTwitter, Brian Maienschein, the Super Bowl, Adam Levine and President Trump and the State of the Union.